If you’re familiar with confinement areas, you probably think of them as small areas that don’t give horses much opportunity to move. However, an emerging trend, called track paddocks, may change the way you view confinement areas. Track paddocks are large, long corridors that circle the perimeter of a pasture or other area. The goal of a track paddock is to encourage horses to move about more freely and interact with each other. Track paddocks are based on concepts brought to the forefront by author Jaime Jackson in his book Paddock Paradise, A Guide to Natural Horse Boarding. Jackson introduced a new way of looking at confinement areas based on his research into how horses live in the wild. Jackson’s ideas draw from his observations on how the horse’s natural instincts stimulate and facilitate movement which Jackson feels helps keep a horse sound, both physically and mentally. Jackson and many others who have tried this approach feel track paddocks have many benefits including fewer vices, healthier hooves and overall improved horse health. A track paddock is generally set up so that it runs along the perimeter of a pasture or property, with permanent fencing on the outside and temporary fencing on the inside. But there are any number of creative ways to shape a track paddock, including circling around a building or arena, or weaving through a trail course. The possibilities are endless. Soil type. Track paddocks require well-drained soils in order for them to be successful. Wet or organic soils will turn to mud with continued heavy use. Land available. Living with horses on one or two acres requires greater creativity in designing track paddocks. 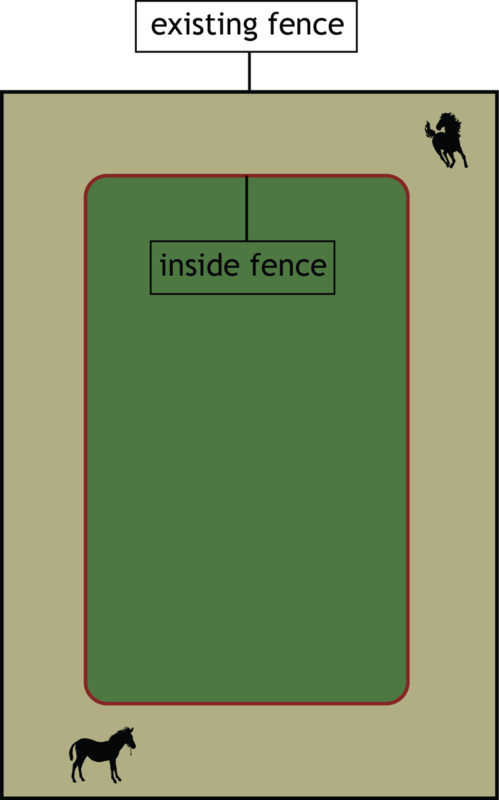 Paddocks may be shaped to fit around a building, arena or pasture perimeter. Be sure to avoid sharp corners on buildings. Track width. This depends on the number of horses you have, their age, breed and temperaments. The narrower the track, the more the horses will move. However, if it’s too narrow and you have multiple horses, one may get cornered by a more dominant horse. Additional movement can be encouraged throughout the track by strategically placing feed and watering points along with other stimuli (such as poles to step over) that activate curiosity or movement. Cost and chore efficiency. Remember, the bigger your track paddock, the more maintenance it will require (e.g., picking up manure and putting down footing in muddy spots). A larger track will also incur more costs (such as fencing or footing).